Cream soap recipes are a great resource for those who want to get back to basics with their skincare and beauty. With so many mass-produced skincare products out there, chances are you have used many items on your body without knowing fully what was in them. If you are fortunate, you have never suffered an allergic reaction to any of the common chemicals or other mildly toxic ingredients often found in skincare and beauty products. By using soap recipes, you have the power to know what exactly is going into your soap and onto your skin. There are no hidden ingredients, no surprise reactions. Pure cream soap recipes can still give you all the benefits of a commercial bar soap, however you are not naively compromising your health. Cream soap recipes are also just a fun activity to partake in with family and friends. You can make soaps as gifts for loved ones, or you can have a stay at home "spa day" if you wish. Below is just one of many soap recipes available via the Internet or in skincare books available at most major retailers. There are a lot of ingredients on this list that may be foreign to most people. The majority of these ingredients can be found at an organic foods store, at a high end natural beauty shop, or at a retailer who sells scientific supplies. Melt the oils and the stearic together very slowly over a low heat. While you are waiting for it to melt, prepare your water and the other ingredients. Add Borax to heated water and stir until it is dissolved, then add the remaining ingredients, except for the glycerin. Before the two mixtures are added together, the water should reach around 120 degrees and the oils should be around 150. Combine the two mixtures while they are both hot. Add the glycerin. Stir the mixture, and it will begin to separate. This will happen several times, but if you are persistent, then you will eventually get one heavy and creamy soap component. 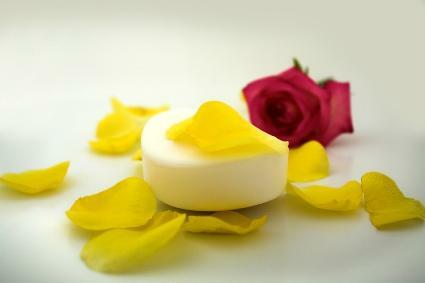 If you would like a specific fragrance to your soap, have a few teaspoons of your favorite essential oil ready. Most soap makers allow their cream soap mixture to cure for around two weeks. You can also cook it in a double boiler or refrigerate it if that is something you prefer. Place your soap in decorative jars if you plan on giving to friends and family. They can enjoy a thick, lathering soap with a touch of homemade love! If the above recipe does not sound easy to you, you aren't alone. Mastering soap recipes is not the easiest thing in the world, and that is why places like the Body Shop charge so much for their skincare products. Making any kind of soap is a craft that only a select group of individuals will have the skill and patience to execute correctly. However, if you are looking for a fun and challenging activity, there is no reason why you shouldn't at least attempt to make the soap on your own. Like any crafty endeavor, things may not turn out right the first time, however the mistake made can still be a wonderful treat for your skin. Making cream soap is about pampering your body, not about getting a perfectly shaped and evenly toned product. Leave that to the professionals. For now, you can be inspired and indulge.